Hindsight, they say, is usually crystal clear. We as football fans want the very best for Arsenal football club, and that includes the players, the manager and everything in general. But with this club, you don’t even know what to expect. One minute, the club is going on a four game winning streak in the league, next minute, they are struggling to break down a Watford side and eventually get beaten. I used to really love writing about Arsenal everyday. Heck, I even called my blog ‘Gooner Daily’. I’ve ran the blog for seven years and I’ve published over 1,600 articles on this site, but in recent times the zeal to write about the club I love so much has somewhat diminished. Maybe it’s because of work, because that takes a lot from me, maybe it’s because I don’t have a deputy to hold the fort for me when I’m not available for one thing or the other. But it’s fine. I’m back now and I hope I’d be consistent enough. There’s no point opening up wounds from the Watford loss over the weekend, so we can only look forward to the Europa League tie, the weekend fixture against Everton and hope to build another consistent run of results. Hey, since losing 4-0 to Liverpool in August, we hit great strides, four wins on the bounce in the Premier League, two wins in our maiden Europa League competition and a comfortable win in the Carabao Cup, but I’m here to talk about Wojciech Szczesny, our ex-Gunner that currently plies his trade in Juventus and is certainly the heir apparent to the legendary Gianluigi Buffon. This summer, I wrote an article about Szczesny’s potential move to Juventus and I was in crossroads on this issue. In my honest opinion, I felt the manager knew his squad enough to see that he couldn’t accommodate Szczesny in it anymore and as opportunistic as the signing of Petr Cech may seem, his arrival certainly meant that Wenger had to make a big decision between Szczesny and David Ospina and even though his initial move to AS Roma was on loan, I was certainly sure that he was on his way out of the club. The Polish goalie returned from his first spell with the Italian outfit, and Arsene Wenger clearly had no plans for him last season, so he was shipped to the same club where he continued his footballing education and added a Golden Glove to his individual collection of accolades. With Szczesny having just a year left on his deal, the Gunners cashed in on him, and Juventus got their man for €12.2 million. So we as Arsenal fans had ‘moved on’ from the Szczesny issue. There were a lot of arguments in several forums like my Arsenal BlackBerry group, Gooner Daily, where some fans believed it was a grave mistake to offload him the way we did, leaving a shaky goalie like Ospina for another season. Ospina has already showed his frailties this season in the Europa League and fans of international football can attest to the fact that he had moments of horror for his nation, Colombia. We certainly trust Cech enough to use him in the Premier League while Ospina manages the Cup games and we were okay with our goalkeeping situation at the moment, but Szczesny speaks to some folks at the Independent about his life at Arsenal and his new adventure with Juventus and you can’t help but feel some type of way after reading the article. I’m in no mood to quote some of the words Szczesny stated in the interview, hey, there’s a link, so you could check it out yourself but he mentioned stuff about improving after he left Arsenal as well as the difference in approach from his days at Arsenal to his time in the Serie A, which he attests to the fact that they are more analytical in the Serie A than in his time at London Colney. He was also specific about the impact the coaches had at Roma, compared to Arsenal, which was an eye opener for me. I started asking myself questions like, ‘why did we have goalkeepers that showed the same traits for that odd error in them consistently?’. C’mon, Manuel Almunia, Jens Lehmann, Lukasz Fabianski, Szczesny, Ospina and even Cech have dropped clangers and made high-profile mistakes while guarding between the sticks at the club. I’m not saying no goalie isn’t capable of committing a blunder every now and then, but some goalies were ticking time bombs at the club. Does this have to do with the kind of goalkeeping coaching they receive? I like Gerry Peyton and I feel he’s a living legend, but I thought we were going to shake things up at the backroom staff level, and with Lehmann joining the coaching ranks, I was hopeful he’d supplement the goalkeeping department, but word on the street is that Lehmann isn’t specifically working with just the goalies. We had a good goalkeeping coach in Tony Roberts but he moved to Wales with Lukasz Fabianski. I was hoping Christophe Lollichon would join Cech when he moved from Chelsea but that never came into fruition. Cech is reaching his twilight years and I expect him to give us maybe 2 more seasons but in Szczesny we would have had a good succession plan, but that’s no longer possible with the goalie now convinced in his heart that Juventus is the place for him. I always get chills when watching Ospina between the sticks because I just feel he’s one mistake away from costing us, irrespective of the opposition, so I’m just hoping that when Wenger decides to leave in 2019, the new manager would come in to shake things up and will probably sign a new goalie. We know the current manager is quite sentimental in his decision making because I don’t see how a manager would favor Ospina ahead of Szczesny in this modern time and age. Posted on October 17, 2017, in Arsenal, Football, Premier League and tagged Arsenal, Football, Wojciech Szczesny. Bookmark the permalink. 2 Comments. 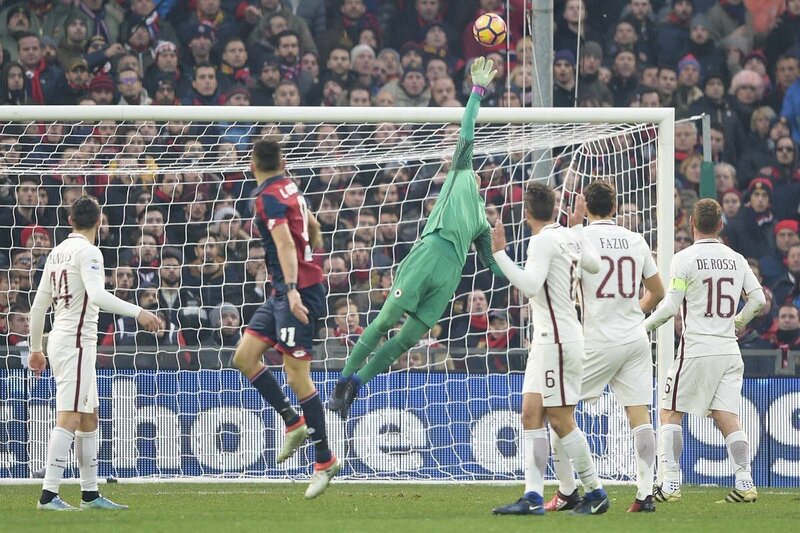 Szczesny was given many opportunities to cement his place, but was too immature, inconsistent and flaky. His recent comments bear that out. Maybe he’s finally maturing and maybe he will go on to be a great keeper. But his attitude at Arsenal meant he wasn’t worth the gamble. Yes I agree with you Nige. He had loads of opportunities while at Arsenal, but I still feel he deserved a second chance, as his performances at Roma showed that he had matured.